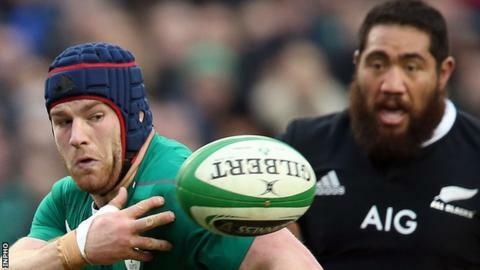 Ireland are to play World Cup winners New Zealand twice in November, with the first match in Chicago and the second at the Aviva Stadium in Dublin. The game at Soldier Field, the home of American Football team the Chicago Bears, is on Saturday, 5 November . The Dublin meeting is scheduled for Saturday, 19 November. Ireland have two other autumn internationals arranged, hosting Canada on 12 November and Australia on 26 November. The Irish have never beaten the All Blacks, losing 24-22 in their last meeting in 2013. The match in Chicago is part the Rugby Weekend, in which the USA Eagles play the Maori All Blacks on Friday, 4 November at Toyota Park, home of MLS club Chicago Fire. "There is a huge population in the USA who are proud of their Irish heritage, as well as large numbers of Irish who have migrated more recently to live and work in the USA," said Philip Browne, Chief Executive of the Irish RFU. "We know that many of these people are Irish rugby fans and we look forward to seeing them pack out the stadium, alongside some of our passionate travelling fans as we take on New Zealand."